So, the hump day of the week and a midweek dose of music is what is called for. While this is an interesting mixture of bands to say the least it should be a good night. Opening the night is Manchester based quartet hot milk. These are a fairly young band and have only been going for about a year. Despite their youth they are one of the tightest bands I have seen in a long time. The split duo lead vocals/guitars are shared by Jim Shaw and Han Mee and from the opening notes of ‘Candy Coated Lies’ it was evident that hot milk are destined for big things. 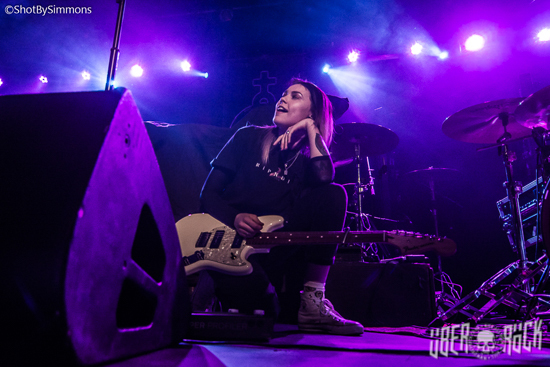 They have been described as emo powerpop which I agree with a little bit but there is more a commercial sense to the tracks with catch riffs and choruses. The rhythm section of bassist Tom Paton and drummer Harry Dellar keep the whole set in perspective and jumping. The set includes ‘Take Your Jacket’, ‘Wide Awake’, ‘Are You Feeling Alive’ and ‘Reaper ‘. The crowd is loving what they are hearing and the sing along has started. Han’s interaction with audience is a big reason the crowd is so enthusiastic while small in stature he personality is huge and infectious. The songs are written in a way which highlights her and Jim’s voices individually and harmonising. It is unique and makes hot milk an act to watch. They close the set with the current single and video ‘Awful Ever After’ which is a perfect ending to a damn good set. hot milk release their new EP, ‘Are You Feeling Alive’, on 3 May. They support Foo Fighters at Belfast Vital on Monday 19 August. Next up is Glasgow upstarts The LaFontaines who have been under going another change in line-up, or should I say downsizing. I first saw them, about seven years ago, when they were a five-piece. Tonight, they are a trio consisting of guitarist Darren McCaughey, drummer Jamie Keenan and vocalist Kerr Okan. For me it was a bit a downer as the guys did their best and Kerr’s interaction with the audience is comical and the older tracks which were in the set do not translate as there is a much heavy reliance on backing tracks. To be honest this is what ruined the set as the vocals were hardly audible and the backing tracks over shadowed what Darren and Jamie were playing. A hat off to the lads for pushing through unfortunately tonight was not a good night for them. The LaFontaines release their new album, ‘Junior’, on 14 June. And, finally, Deaf Havana hit the stage after a 30-minute break, which also saw a lot of activity at the mix board in order to ensure they didn’t have the same issue with the backing tracks. As drummer Tom said during the set “We’re the band people like to ignore”; however, the audience in attendance has filled the venue out. Claire and I have seen and interviewed the band over the years and to be honest this is the best I have seen deaf Havana over the years. 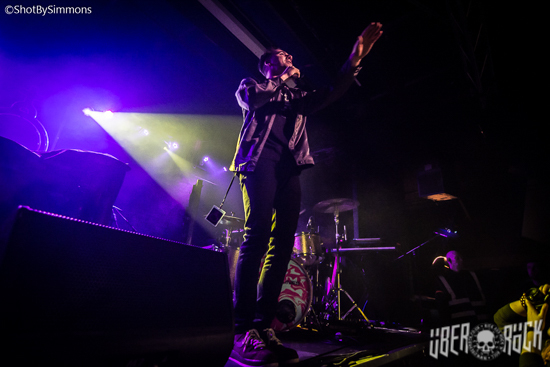 James has become a very confident lyricist and frontman and commands the audience’s attention and the admiration. The fans here are both old and new, as the latest album ‘Rituals’ is a departure from their previous sound and the songs have taken on a more personal edge. While many have considered the album more pop, and over-laboured and over-produced, I disagree. The songs translate very well live and by James meeting the writing challenge has come up with a style that combines their past with the future. Having recorded it in Sheffield in 2018 many of the tracks in tonight’s show are from this album. 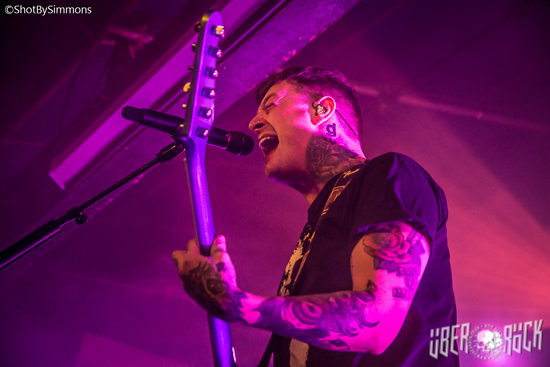 The set consists of 18 tracks which could be the basis for a greatest hits album, as the audience was in a singing mode and helped Deaf Havana soar. Deaf Havana’s ‘Live At The Brixton Academy’ is out now. 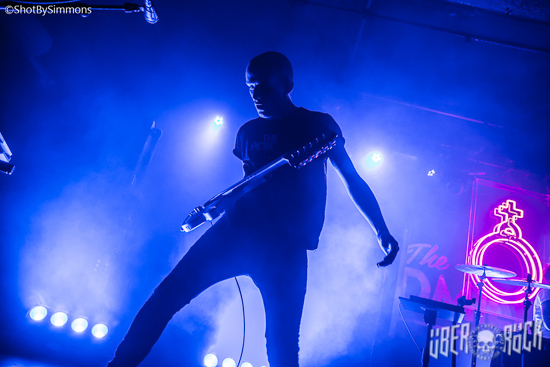 They headline the Camden Rocks festival on Sunday 2 June and the 2000 Trees festival on Saturday 13 July. PHOTO CREDIT: All photos © Shot By Simmons/Über Rock. You can view our full gallery of photographs HERE.